Have you ever wanted to create your own social network like Instagram, Twitter or Facebook? Launching a project that can accumulate thousands of users in one place? WE JUST LAUNCHED A FIRST ANDROID (beta) VERSION OF THIS PROJECT. BENEFIT FROM THE LOW PRICE AND BUY THE PROJECT TODAY. Here is the Social Network Template for iOS and Android (beta) that allows you to achieve your biggest dreams when it comes to social networking. It is a Twitter-like social network where you can post tweets, photos and videos, like the posts of your friends and leave comments with hashtags and tags for them. With this template, you will never again miss the best moments of your friends' lives, but always be part of it. You will find every main feature a social network should have in this project, even a photo editor functionality so that your photos always look stunning. You simply follow all your friends, lean back, and observe how your newsfeed fills with valuable moments of your friends' lives. And in case you have something to say that is not meant for the big public and all your followers, you can user the build-in chat to send text messages, photos, videos and even audio messages. With the new read and delivered receipts you see if you beloved ones have read your message and even get notified when they're about to answer with a tiny typing indicator. With the activity system, you don't miss anything because you get notified of every like and comment on your post. And in case you absolutely want to show a photo to your friend or simply want to answer to a comment, you can mention your friends, just as you're used to it. And whenever you want to search for a specific theme, simply use the search function of the app, browsing through the different hashtags that have been left on the photos. This project now even has a popular posts feed, showing you the most popular posts and a recent posts feed, showing you the most recent posts. A demo of the android version is available here, make sure you check it out! Note that the android version is still in beta mod and has been released recently. It doesn't have every feature of the iOS version yet (esp. the chat feature). But we will continue working on it and providing you more features with several updates. The technical part, how does all of this actually work? The best thing first: maintaining this social network is completely free, you don't need to host any servers, nor mess around with server-side development or spend money for file storage. 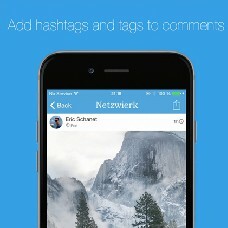 This project uses back4app.com (for the users, photos, comments, etc. - please see the note about Parse below!) and Firebase.com (for the private chat messages) as backend. Both services have an excellent free plan with lots of storage, allowing you to be not depending on revenues. Furthermore, these services allow you to fully concentrate on the frontend, the user interface, so that you can create a stunning and unforgettable experience for your users. We are using the open sourced Parse API on the servers of back4app. NOTE: The preview shows the app how it would run on a simulator, and not on a physical device. The simulator version does not support videos nor tweets and also other features are not available. About Parse and back4app: As you might already know, Parse is officially winding down its services. The sunset period will be completed on January 28 2017, so we still have a year. The most recent update v2.14 of this project introduces a way to migrate over to back4app, however, we still need to update our cloud code files for push notifications to also work with back4app. Thus, if you absolutely need to have push notifications working, consider waiting with the migration until the next update in which we will introduce push notifications for back4app. If you want to buy this project, and want to use a previous version of it, please don't hesitate to contact me and I will happily provide you with a previous version. The project can still use Parse.com by uncommenting a single line, in case you want to switch back to Parse.com until you're completely sure about back4app. With the social network template, you get your hands on a complete social network with the following features. Clean and fully documented code, written in Objective-C/Java with a full documentation file in .html and .pdf and a detailed Setup Guide. As already mentioned, this project does not require PHP files at all. All your data is stored on back4app.com and Firebase.com, thus you don't have to spend a single dollar on data storage but still have full control over your user- and database. This project also uses several third-party libraries. Some of the Controllers and methods and especially parts of the caching system are taken from Anypic, an open source iOS social networking project showcasing the services from Parse.com. If you want to start from complete scratch with your social network, this project is an excellent starting point. The messenger functionality is based on the JSQMessagesViewController by Jesse Squires and uses some modified parts and ideas (esp. the Firebase.com idea) from NotificationChat from RelatedCode, which gives you a good starting point when you want to adapt the JSQMessagesViewController to work with Parse.com. The project comes with a completely documented source code, a full separate documentation explaining every method and variable as well as a Setup Guide, guiding you through the basic setup. Basically, you need to register yourself for free at back4app.com and Firebase.com and create new application. For the Facebook login, you need to create a free application on the Facebook developer page. In order to reskin the project, you need to change the design of ~150 images, where nearly half of them are simple @2x duplicates. Some of the controllers support .xib files (for example the LaunchScreen.xib) and are really easy to customise. Those not supporting .xib files can be customised by changing the straightforward design code parts . More information is in the Setup Guide document. This version log does not contain all the updates, only the major ones. Introducing a popular posts feed. This feed can be accessed from within the side controller and shows the most popular posts. Added a popular pointing system, comments currently give 1 point, and likes 3 points. In theConstants.h file is a new defined constant determining how much points a post must have at least (currently 10). Posts that aren't older than a week and have been updated in the last 24hrs can then be popular (and are ordered by popularity points). Changed the login to a new form - now logging in with the email address of the user, avoiding the confusion between the name and the username.
? Introducing tweets - you can now post text posts with a maximal length of 120 characters (easily customizable). This first version of the tweets includes hashtags, links and mentions already.
? Introducing a custom in-app-webbrowser. Every link that is tapped from within the app is now opened in a custom webbrowser inside of the app itself. The user doesn't have to leave the app anymore.
? Extended settings features in the settings page - you can now control if you want to receive push notifications or send read receipts in the chat.
? Introducing the recent posts feed - this feed shows you the most recent posts, independent from who you follow.
? Fixing several bugs - a video playback bug, opening profiles from within the chat had some weird problems, profiles now open in the right tab, hashtags can now be searched even with the <span class="com">#</span>sign, the chat has been improved in general because it had some weak moments, the caching system has been improved esp. for the use of tweets and other minor design and performance improvements have been included.
? Introducing a new follower and following view, and fixing several bugs.
? This version introduces a background job you need to run on your parse app. Simply set it to run every day at 00:00 o'clock and Parse will do the rest for you. This background job handles corrupted follow activity objects and is necessary for the follower/following list to work.
? Updating the project to XCode 7 and making it iOS9 ready. Please do not use XCode6 nor iOS8 anymore (if possible). Introducing the first Android version of this project. This first version hasn't all the features of the iOS version, but we will provide more and more features with upcoming updates. Make sure you check it out! Fixing several bugs in the Chat ViewController and deleting some unused png's to make the project a bit lighter. Fixing a few minor bugs as well as e critical bug that caused a terrible image quality when uploading an image. Adding sponsored posts functionality. The photo class contains a new ?isSponsored? field (boolean) in the Parse Database. For every post that is published on the app, you can decide whether it should be a sponsored post or not, by setting this field to true. Sponsored posts will show in everyone?s newsfeed, whether they follow that user or not! However, sponsored posts appear only in the home feed and in the popular feed (this can be changed easily by copying the code to other feeds). Sponsored posts will have a sponsored badge in their header. This is an Android only update. We had some busy weeks, with the news of Parse shutting down, thus this update is a smaller one. It is fixing some critical bugs in the Android beta project, and enabling Facebook login. This is an Android only update. It is fixing some critical bugs and improving the comments page a lot. This is just a hot fix for the Facebook sharing that recently broke because Facebook changed their policies. This is an Android only update. It is introducing a new PhotoActivity, which should resolve any resolution bug you might have encountered with your specific Android device. This is an Android only update. Fixing some minor bugs and adding some new animations. Also improving performance in the PhotoActivity. We're finally migrating this project over to back4app. Back4app installs the open source Parse API for you on their servers, such that you can do a nearly one-click migration. It's really easy, for details, please refer to the setup guide. You can also still migrate to your own Parse server if you want to. Please note: Pushes are not yet working with back4app because we still need to rewrite our cloud code files. This will be done in the next update! As always, feel free to report any bug to me, so I can fix them as soon as possible. Cheers, Eric.